A mix of guided and unguided hiking. 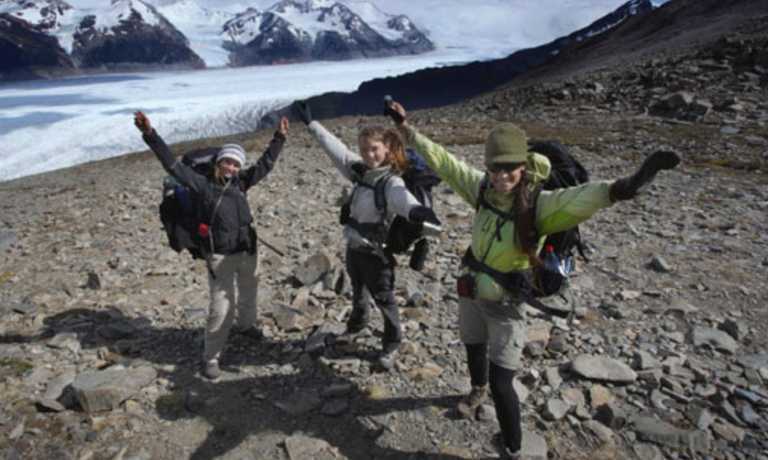 You walk the well-marked W Trek unaided, meet your guide for the tougher northern section on Day 4 and head on to the John Garner Pass with the unmatched views of Grey Glacier and the Pingo mountain range that make the full circuit so rewarding. NOTE: The trek will be guided for the first portion of the trek where you head into the remote northern side of the Park and then you will be left to hike the frontside W trail independently. Early in the morning you will depart on a bus from Puerto Natales to Torres del Paine. The trip to the park entrance at Laguna Amarga is approximately two hours. After arriving to and registering yourself in the park and dropping your belongings off at your campsite, you will begin to hike up Almirante Nieto, a mountain with incredible views of Lake Nordenskjold and the Asencio Valley. After two hours of hiking steadily upward you will arrive to Refugio & Camping Chileno where you will be able to enjoy your lunch before continuing onto the Las Torres lookout. You will hike about an hour through a dense Lenga forest. Once you leave the forest you will approach a moraine and climb to see the granite peaks known as the Torres. After admiring the view you will return to Camping Central where you will have dinner and sleep. Today you will meet your guide and begin with a four-hour hike along a fairly flat trail. As you wind along Paine River, you will admire the deep blue waters of Laguna Azul and the picturesque view of Encantado Valley (a valley surrounded by rock formations created by centuries of wind). When you reach Dome & Camping Seron, an old Baqueano (Patagonia cowboy) post, the land will stretch out before you. This lovely day will end with dinner, after which you will fall asleep under the brightly shining stars. 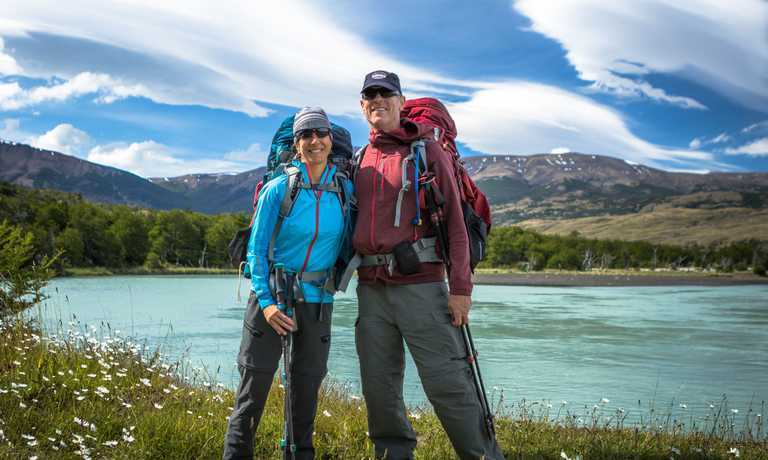 Today’s seven-hour hike will begin with a steady walk up a hill and past a small lagoon, where you will reach a lookout with an incredible view of Lake Paine. As you descend the hill, breathtaking views will surround you. You will be able to see the mountains that separate Chile and Argentina, along with the mountains located on the northern side of the park’s Paine Massif. As you continue to hike, you will cross a marsh on boardwalks that park rangers have created. After traversing the marsh, you will begin crossing ancient moraine valleys and you will notice the imposing glacier tongue of the Southern Ice Field. You will continue to Camping Dickson where you will spend the evening. After breakfast you will begin hiking! Today the trek is approximately four hours long and it will take you through one of the oldest forests in the park. The trail will lead you past Lengas and Coigues (both of which grew shortly after the glaciers receded). Finally, you will reach a moraine at the foot of Glacier Los Perros. Here you will set up camp. You will wake up and have breakfast in a beautiful forest. In the morning, you will start climbing a slow but steady hill for approximately 200 meters. The trail is very moist and the beautiful Lenga and Coigue trees cover this portion of the trail. After an hour and fifteen minutes, you will reach the end of the forest and you will finally begin trekking up rockslides towards the John Gardner Pass. After forty more minutes of hiking, you will reach smaller patches of trees all the while gaining a bit of elevation. From this part of the trail, you will be able to see Glaciar Amistad, Cerro Blanco Sur, Punta Puma and – finally – the John Gardner Pass. From here, you will begin climbing until you reach 1,200 meters. 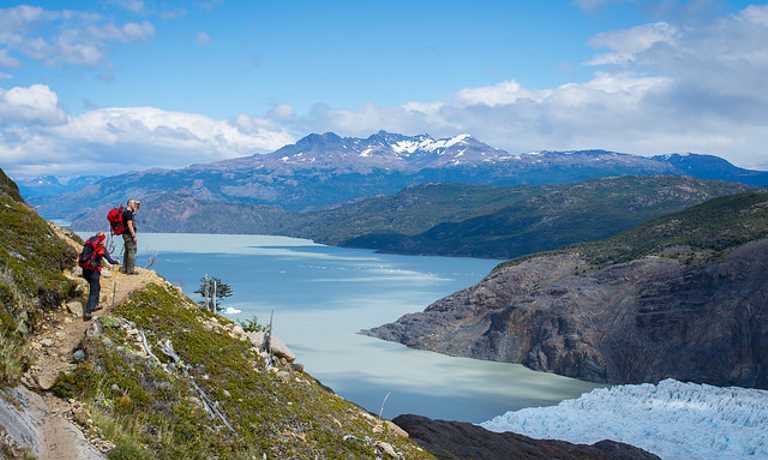 You will have an astonishing view of Glacier Grey and Patagonia’s Southern Ice Field. After catching this breath-taking view, you will begin hiking downhill for about two hours until you reach Campamento Paso for a short rest. From here you will continue hiking for four more hours along an undulating trail with views of Glacier Grey, Lake Grey, and Ferrier Hill. Before reaching Campamento Grey you will cross several of the parks famous suspension bridges, ultimately bringing you to some close-up views of Glacier Grey. Once you reach Grey you will have time to shower and rest before enjoying a nice hot meal in the Refugio. After a restful night and an energizing breakfast you will be ready to hike again. Your guide will be leaving you early today to catch the first bus back to Puerto Natales. Today you will have a four-hour hike along Lake Grey and then through a small forest. Most days this section of the park is very windy due to the openness provided by Lake Grey, Glacier Grey and the Southern Ice Field. 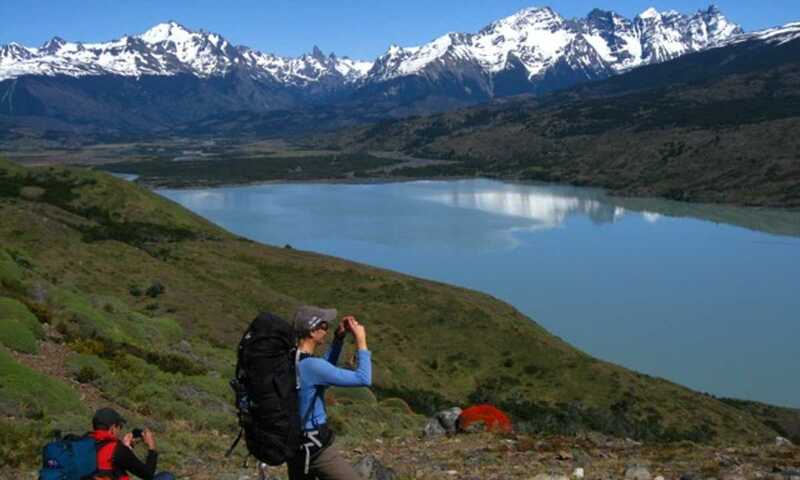 In the afternoon you will arrive to Camping Paine Grande on the shore of the beautiful Lake Pehoe. This spectacular day will begin with a leisurely hike in the energizing mountain air to the entrance of the French Valley. As you walk along the border of Lake Skottsberg, you will admire the tremendous peaks towering in front of you – Los Cuernos! After about 2.5 hours, you will arrive to Campamento Italiano where you can rest for a bit before continuing your journey. As you ascend into the valley, the views in every direction — of Lake Nordenskjold, Los Cuernos, and the French Glacier — are absolutely stunning. In the back of the valley you can see various peaks. After soaking up the view, you will hike back down to Campamento Italiano to continue alongside rolling hills as you follow the coastline of Lake Nordenskjold. You will continue on for another two hours until you reach your camp, located on the lake. After a relaxing afternoon and a filling dinner, you will go to bed for a deserving night’s sleep. In the morning you will have breakfast and prepare to hike again. You will leave the monstrous Cuernos and begin hiking back to entrance of the park. The walk is about four hours in duration and you will arrive at Las Torres in time to take a shuttle back to Laguna Amarga. From there you will take another bus all the way back to Puerto Natales. You will arrive back to Puerto Natales in the evening – just in time for dinner and a cozy night ́s sleep in a warm bed. This trip can run as a group trip, with prices starting from $2,205 per person for a complete group. If you are looking to join a group or you are a solo traveller we will help to form likeminded groups of travellers. Please let us know your travel plans. The trip can also run on a private basis to fit around your plans. Departures may be tailored and can be set up on a date of your choice. Please note that there is a higher price for smaller groups. Please enquire for further details.